Michael Scott is one of the true musical shamans of the West. 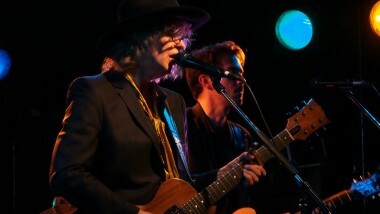 Since the early days of the 1980s, when he founded the Waterboys, he has always been haunted by big musical ambitions. The ’80s, by the way, was a time of relative musical megalomania, and, while some of that succeeded, most of it soared off into self-parody and excess. But such a fate was never going to befall the Waterboys. While sketching out vast ambitions and attracting the kind of interests that suggested later superstardom, Scott’s musical GPS was always set to authenticity, leading him and those who stayed with him down paths where the masses and record companies had trouble following. But Scott is a man of such musical fecundity and poetic genius that he could keep a musical career going in the vacuum of space. This explains the band’s cult following: Waterboys fans are never fans just for Xmas, they are fans for life. This is testified to tonight at a packed Club Quattro in Shibuya, the band’s first gig in Japan in eighteen years. After a lively opening, with three tracks from the new album, Scott addresses the crowd. A few from the audience shout back that they already got divorced, hinting at the false starts and disappointed dreams that in a sense also litter the Waterboy’s own career. But while the going has never been smooth, it has always been interesting. Two of the songs tonight come from what is perhaps the greatest album of the millennium so far, 2011’s An Appointment with Mr. Yeats, a masterful setting to music of the works of the great Irish poet W.B.Yeats, the kind of project that reeks of Mike Scott’s typical left-field ambition. Singing kappa? Photo by C.B. Liddell. 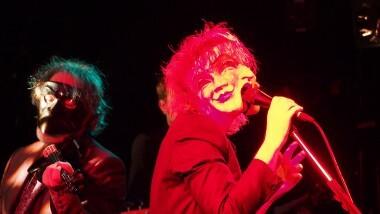 After a build-up by Scott on keyboards, Wickham enters the stage, wearing the kind of beaked mask made familiar to many by Stanley Kubrick’s Eyes Wide Shut, but suggesting a kappa to Japanese audiences. Wheeling round like a dervish, he takes the audience’s eyes off Scott, who then reappears wearing his own assemblage of masks, looking like a three-faced entity from Hades, to intone the words of Yeat’s apocalyptic poem The Second Coming. Potent, powerful, and mesmerizing stuff! Along with Wickham’s swooping fiddle, Ernst’s squally and biting guitar is a notable feature of most of the night’s proceedings. 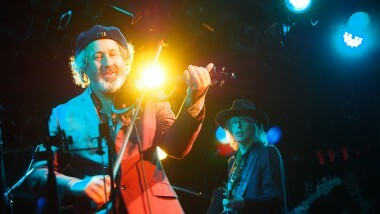 The demonic fiddling of Steve Wickham. Photo by C.B. Liddell. Keeping things rhythmically tight, but not constricted at the back, is Ralph Salmins, a professor at the Royal College of Music, no less, who has also made three albums with Celtic blues legend Van Morrison. 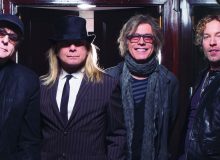 This “Van the Man” connection seems to point to the Waterboys’ latest strategy. Morrison, with his concept of “Caledonian soul” and his references to the ancient Scottish border ballads as one of the wellsprings of the Blues, is one of the few white musicians who comes across as an authentic bluesman. With “Modern Blues,” Scott seems bent on mining the same seam. On songs like “Still a Freak” and “The Nearest Thing to Hip,” the formula seems to be working—even with Scott’s more limited vocal range. This Japan gig is a one-off on a world tour, with the band breaking up a long flight between Australia and America, two markets where the folk-rock, blues, and shamanism packed into their luggage give them much more purchase than they could ever have in Japan. Just don’t leave it for eighteen bloody years next time, Mike. There’s only so many times most of us can get married and divorced.